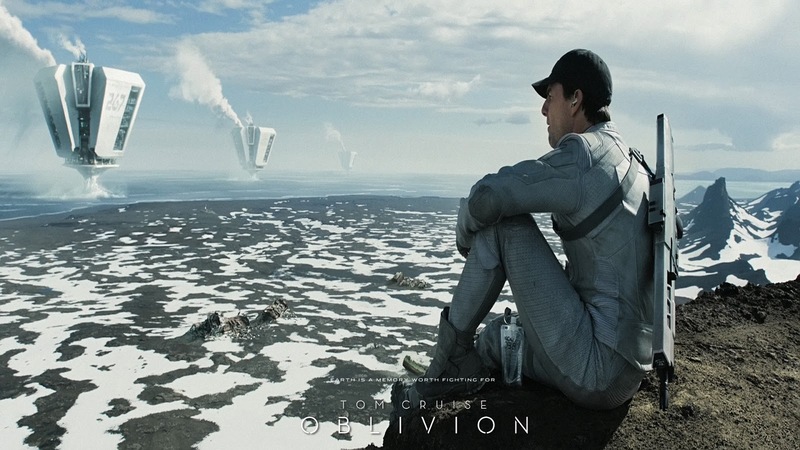 To commemorate the website’s return from winter hiatus, I am happy to submit this review of the Tom Cruise movie Oblivion. Oblivion is a genuinely dumb movie with a couple of truly exquisite details. Mind you, I say this as a form of praise – I would much rather watch a bad movie with some fun high points, than a wholly mediocre movie that stays at the same level of “meh” throughout. 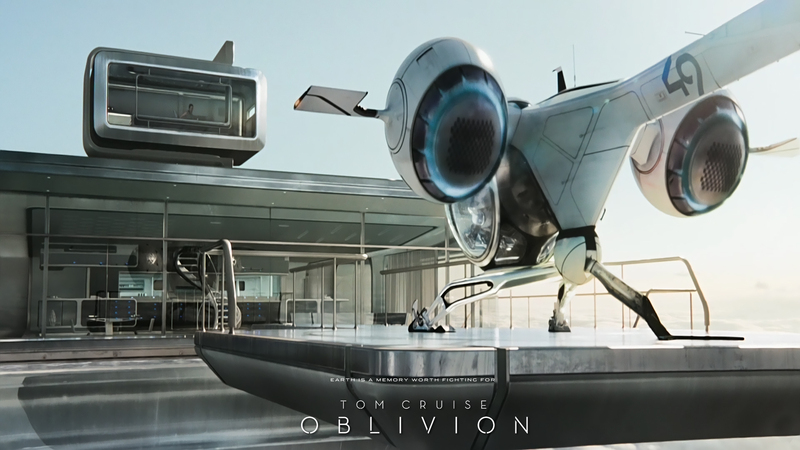 Directed by Joseph Kosinski, Oblivion has finally washed ashore on HBO, a piece of highly polished driftwood leftover from last year’s veritable tropical storm of tersely titled (and largerly “meh”) apocalyptic fantasias. Kosinski previously directed Tron: Legacy and a bunch of really cool video game commercials, which is actually a pretty apt gauge for what Oblivion feels like. The movie is adapted from Kosinski’s own unpublished graphic novel of the same name. Tom Cruise plays a handsome future mechanic, servicing repair drones and energy collection plants after Earth has been decimated in a war with extraterrestrials. The humans won the war, we are told, but a third of the planet was left uninhabitable. As a result the population has relocated to Saturn’s moon Titan. Cruise and his girlfriend/handler, played by Andrea Riseborough, have been left behind as part of the “clean-up crew” and have conveniently had their memories wiped to help them be a more “effective team.” They live in an awesome tower that is basically a cross between the house from The Jetsons and Tony Stark’s house in Iron Man. 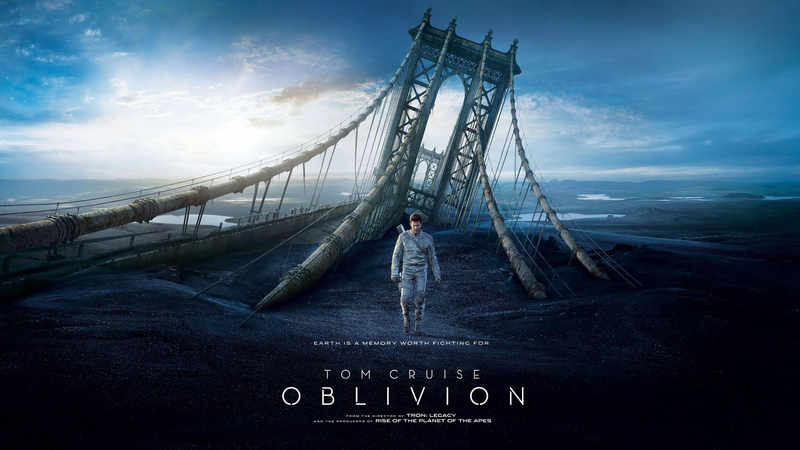 Cruise flies a slick futuristic plane that backflips off the platform whenever he needs to venture out into the inhabitable parts of their sector. 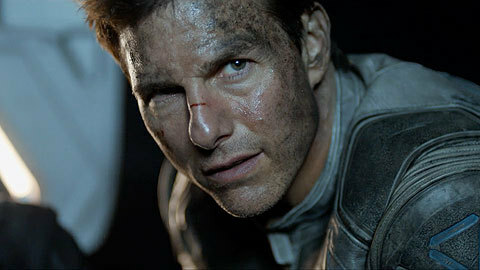 While on these patrols, Tom Cruise occasionally gets into skirmishes with scavengers – the “Scavs” – who are the heavily armored remnants of the alien army. At night Cruise and Riseborough have candlelight dinners, they drink wine, and they do it in their future pool. They’re only outside contact is with Mission Control on Titan, embodied by a jumpy video of a genial southern lady named Sally, played by Melissa Leo. Such is the status quo in the first act of Oblivion. The second act turns on a couple of MASSIVE coincidences and twists, but I’d be lying if I said I didn’t get a kick out of most of them. One of the most basic required skills in putting together a movie like this is the ability to set up expectations and then defy them – whatever the movie’s flaws, Kosinski at least knows what he’s doing in this regard. And while some of the broader swoops of the plot are pretty lame, Kosinski also nails it on the tiny specificities. Cruise eventually learns that the humans actually lost the war, and that he is in fact the unknowing agent of the extraterrestrials, who have taken control of the planet. The “Scavs” are actually a band of renegade humans led by Morgan Freeman and Jaime Lannister. An early fight with Jaime Lannister leaves Cruise with a tiny cut across his nose. It’s just a small makeup effect, in the proud tradition of minor face wounds applied to good looking action stars since time immemorial, but Kosinski — brilliantly — makes it crucially important. Just a few minutes later into the movie, Cruise’s plane crash lands in the “Radiation Zone,” an idea pilfered in every respect from the “Forbidden Zone” in the original Planet of the Apes. To Cruise’s surprise, he doesn’t immediately die of radiation poisoning like his years of training have told him. In fact, he finds a clone of himself there, in an identical outfit and an identical slick futuristic plane. Inevitably, the two Cruises fight and that tiny cut on his nose is the only way we can really keep track of which one is “our” Tom Cruise. After killing the other Cruise, “our” nose cut Cruise puts on the other guys jumpsuit, which is numbered “52” instead of “42.” The full scope of the revelation is that there are scores of unknowing Tom Cruise clones working in these multiple sectors of the planet and the “Radiation Zones” are the way they keep them away from each other. It turns out Cruise’s character and his girlfriend/handler were astronauts that the aliens got their hands on years ago – the aliens cloned them and used them as an invasion force. Now, the war over and Earth’s resources won for the aliens, a skeleton crew of Tom Cruises and Andrea Riseboroughs remain behind to maintain the equipment and finish off the remaining members of the human resistance. Every aspect of his life – Riseborough, their private in-jokes, Sally at Mission Control – has been repurposed by the aliens using information gleaned from their spaceship’s transmissions all those years ago. 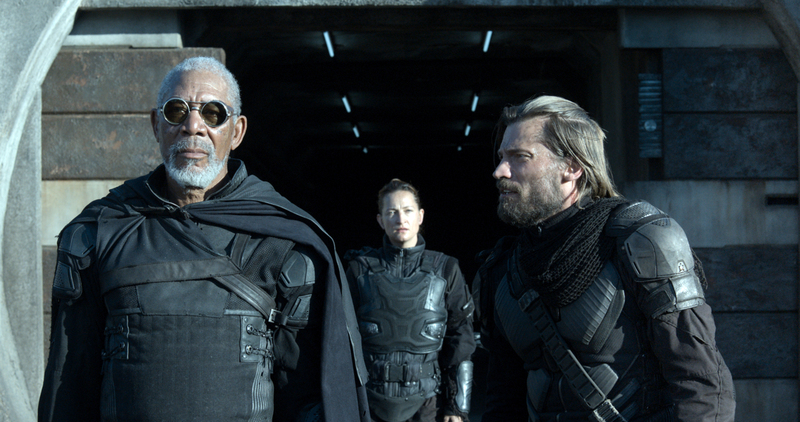 But this Tom Cruise clone is different – thanks to the sage-like counsel of Morgan Freeman, he joins up with the human resistance and, in the endgame, he agrees to fly a bomb back to the mother ship and blow up all the aliens. After all, they will recognize him as one of theirs. Anyone who has seen Independence Day knows that this is hardly an original master plan – again, what makes it work is the amusingly bizarre details. 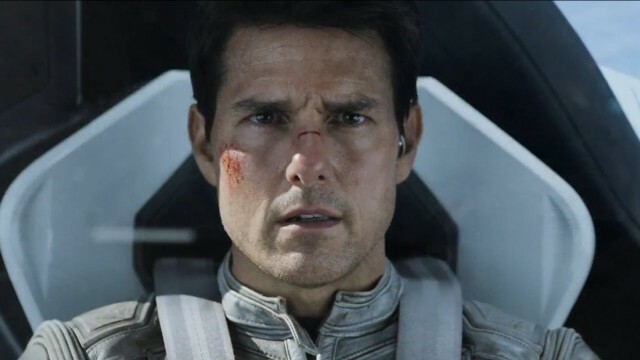 As Cruise flies his plane up into space, he continues to address “Sally” at “Mission Control,” knowing that she is merely the mouthpiece through which the aliens are speaking to him. As a reminder, Sally is a sunny-voiced southern lady; though her tone darkens a bit when she starts to figure out that something is up. She lets Cruise into the huge ship anyway. He flies through the vast interior of the mother ship and eventually comes face to face with “Sally,” a giant inverted black pyramid with an eye in the center. 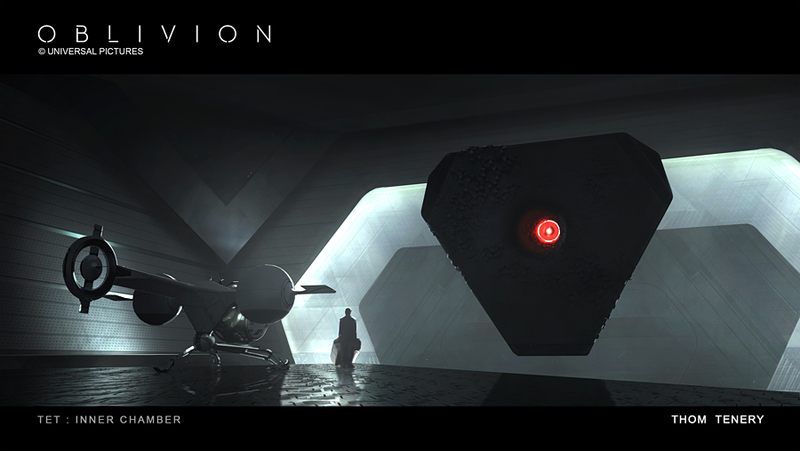 It’s a pretty cool design, even if it cribs heavily from both 2001’s monolith and basic Illuminati iconography. And yet in this climactic scene, this creature – brilliantly – continues to speak to Cruise in English and in Sally’s southern drawl. It’s the kind of fun specificity that huge movies like this desperately need more of. In a lesser movie, the pyramid thing would have spoken in subtitles or telepathically or not at all. I feel like I’ve seen the scene where the hero bravely flies into the mother ship and confronts the freaky alien hive-mind a dozen times, but never with such a specific, delightfully dissonant voice talent like Leo. It’s heartening to me that a boardroom full of jaded Hollywood executives looked at this and didn’t say, “What the hell is that? That’s too weird. People are going to laugh at that.” Probably it’s because it works – the contrast brings a truly sinister component to the scene, in addition to the raw absurdity. As the in-theater movie going experience dwindles down to viewer-test franchises and cookie-cutter action tentpoles, they will have to do things like this more often. Especially if four identical looking sci-fi action movies are going to come out in the same summer, they are going to have to do more to distinguish themselves from each other. Much like Tom Cruise’s delightful little nose cut, flourishes like this make it easier to tell these movies apart. This plot kind of reminds me Moon. If you haven’t seen that you should really check it out. Moon is definitely in the upper echelon of truly great low budget sci fi movies for me, right there with Primer, Looper, and Europa Report. I’m glad you’ve seen Moon, Sam, because it’s an especially great movie for fans of Sam Rockwell. If you like Moon you’ll like Source Code, and if you like Sam Rockwell you will like The Way Way Back. I thought Oblivion was a little meh the first time i watched it, but I’ve since found watching it again and listening the marvellous soundtrack have rewarded me with a better appreciation for the movie. It’s grown on me and I now rate it as one of the better movies of 2013.